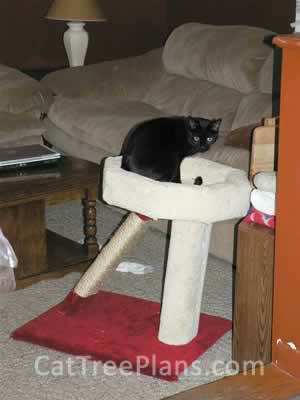 This is our cat Jasper on one of your cat tree plans. This is such a cute pose; I thought you all would like it. 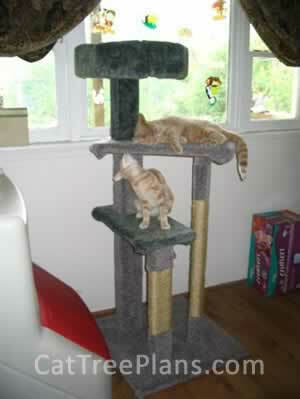 Jasper and my other cat Jade can’t get enough of their cat tree. Thanks very much! 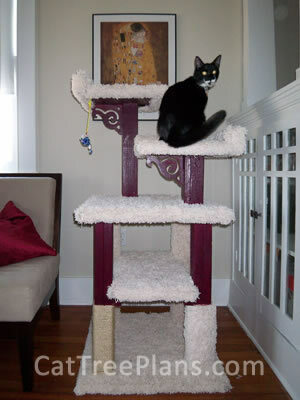 I recently completed cat tree #5, the staircase, using your plans. The plans were great, easy to follow. I modified the top to a step or flat board instead of the octagon. I made mine a bit taller than the plan specs and it stands about 7 feet. It was a lot of fun to make and as you can see Mazzy, Zeeta and Keeley are making good use of it. Your plans are great and the furniture is sturdy. Your plans are great and really easy to follow. It took me a few days to get it completely done. 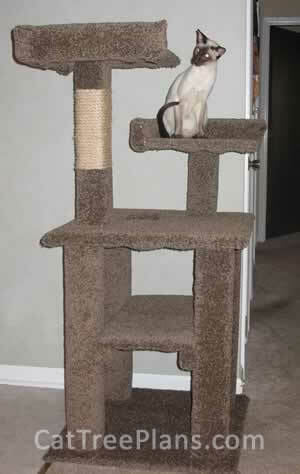 My cat Joey loves it. He loves to look out the window and survey his Kingdom! 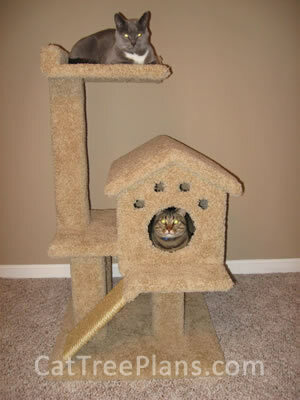 Here is Buddy and Maddie in their new Missouri tree house. Me and my wife had fun building this over the thanksgiving holiday. 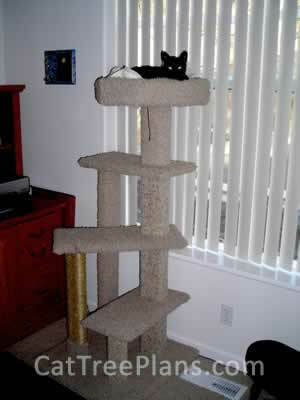 The cat tree came out perfect. The cats (and girlfriend) love it! The plans were detailed and easy to follow. Thank you! As you can see Pie (bottom) and Piper (top) love their new hangout! Plans were detailed and very easy to follow, even for a novice. Highly recommend purchasing these plans. Thank you! Added on a house with a hinged door for easy cleaning. Nice plans very easy to follow. Thanks for the plans. 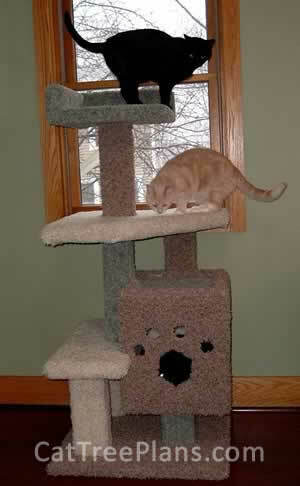 Cats are already scratching the tree rather than the couch. The one with the cone is Sebastian the other one is Bessie. Sebastian was in a brawl a few weeks back and got a cut on his neck. He kept scratching himself, keeping the wound raw and unable to heal, hence the cone, for his own good. He is quite miserable, but it does provide him a shield because Bessie can be pretty nasty when she whacks him on the head. 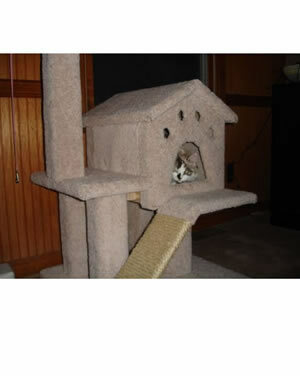 Madeline just loves her new condo. Easy to follow plans and a great product. I made the door a little larger than the plans call for. Can't wait to start on a couple more for our cats. This one was for my daughter. Attached is my attempt at the Mistoffolees Castle. Keep in mind I'm a complete newbie to doing projects of this nature, so please forgive some of the errors you'll notice. The errors were due to my inexperience and not a reflection of the plans. The plans are excellent and I'm 100% satisfied with your directions. 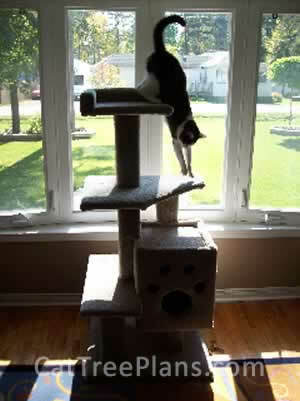 I know I'll try one of the other trees, possibly the window perch next. Pictured with the Castle is my Chocolate Point Siamese, Joe Tabasco. He absolutely loves the tree and I'm glad I decided to tackle this project. Thanks for the awesome plans and I hope you'll post my pic! 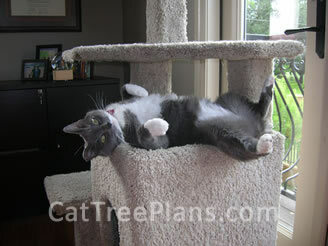 I just wanted to take a moment to tell you how pleased I was with your cat tree plans. I chose the Rumpleteazer Hideout to create. 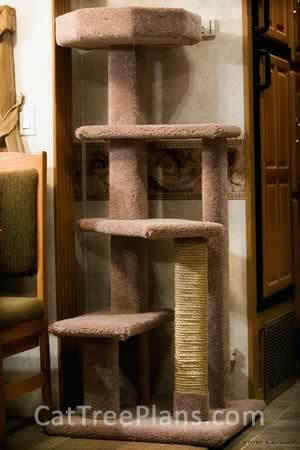 I have 5 cats that would be using it, so I liked the many levels. Your directions were great and easy to follow and understand. I went to our local carpet store for remnants that would match the room - the carpet was only $10! And I love the multi colors. 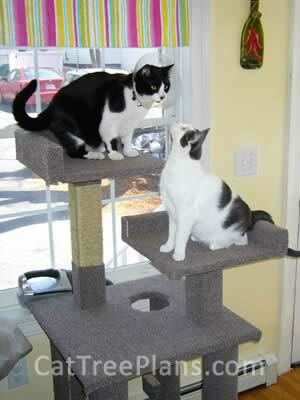 The tree is a very sturdy, well constructed piece of furniture. Visitors are amazed we made it and how nice it is. I volunteer at a local animal shelter - we have an annual fundraiser with a raffle and chinese auction. I am considering making one to donate. I know it would be a huge hit. 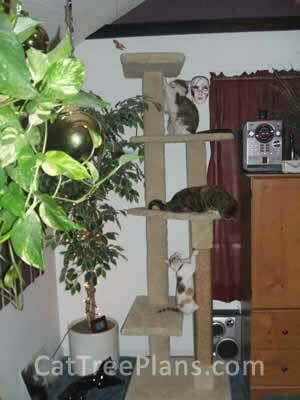 I have included a photo of our tree - there are 3 cats on it (one is in the condo). Thanks again for such a wonderful product - I tell everyone about you. Our cats say thanks, too! 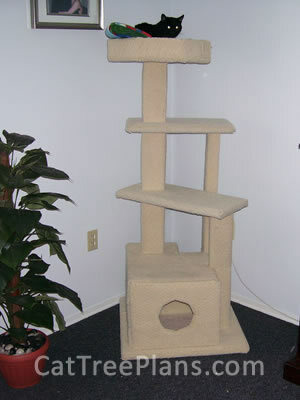 Here is a picture of the cat tree I built using your cat tree plans. I built the castle with a couple of modifications. I used a bed instead of a second square perch and more sisal rope. The plans were easy to follow and the project was alot of fun. 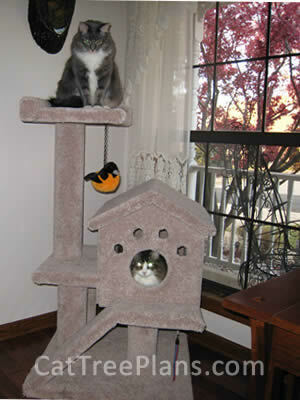 I am planning to build a couple of the window perchs for the local animal shelter. Thanks for the plans. Here's the completed plan 5, in my travel trailer. We got a little carried away and morphed two of your plans. 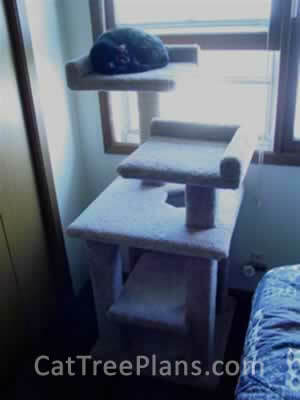 It ended up bigger than I anticipated, but our four cats love it! Your plans were very well laid out and easy to follow. Thank you! 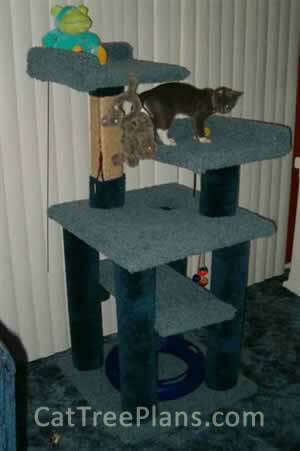 My dad made Cat Tree #5 for Sophie and she loves it! Now she can look out the window for hours on a perfect perch. It took her a while to get up to the top, but now that is her favorite place to sleep.Thank you for the wonderful plans. Here's our kitten Kermie, just relaxing away in his new favorite spot! I made several changes to this design including making the second layer wider and adding an edge so it could be a sleeping area. 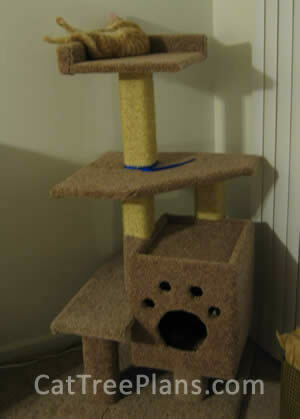 I also widened and lengthened the third layer so that my female, who is rather timid, could get up and down easier. Per your plans, I just finished the Staircase. I reversed the plans due to room layout, and decide to add a support -- a 2X2 -- to the bottom step, but other than that the plans were complete and easy-to-follow. 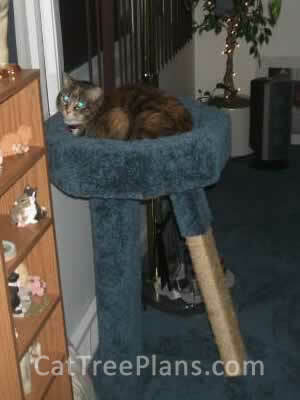 The cat in question took a long time -- like ten minutes -- to discover the utility and great perch at the top. She's virtually in Seventh Heaven as we speak. What's hanging down is the end of her "mouse". She now jumps from the top perch to my shoulder when I'm working on the computer at the left. Just wanted to say thanks for the plans. I believe your very detailed plans could guide anyone to success. 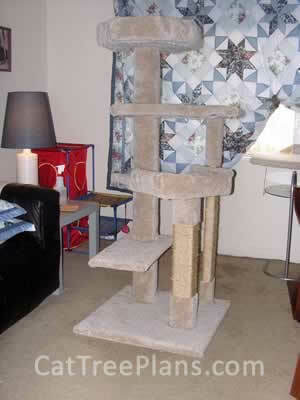 My original plan called for a 48X24 base, but I altered this to two 24X24 in parts to facilitate easy movement through our home but required I go from 6 main uprights to 8. the design is a combination of a couple of your plans, with a location for his litter, and a feeding station free form his doggie roommates noses. Saffron is enjoying his new plaything, and we had fun building it. it was completed in two days, again thanks to the well written plans. 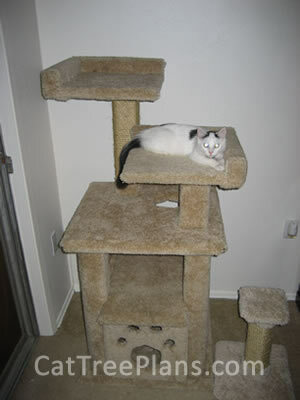 Just a note to tell you how incredibly easy and fun the first cat tree I've ever made was. Your instructions were so complete and everything went together perfectly. I thought the carpeting would be difficult but that turned out to be the easiest part. I finished everything in 2 days. Hope you get the picture of my kitten Cooper playing. Thanks again! This is Ernykins in Ohio. He loved the tree even though it turned out a little "lopsided". 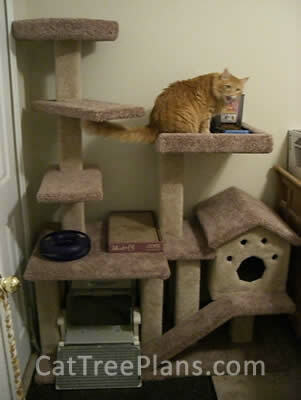 We have purchased the plans for your cat stands to help make things simpler for us. It worked. With a few modifications we made our own staircase named: Jon's Staircase. 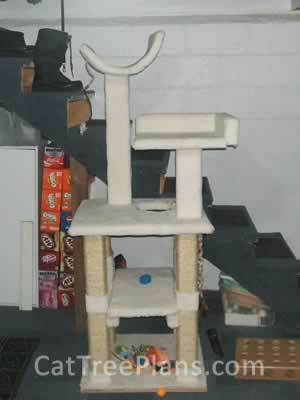 My 7 year old daughter helped to make this stand for a 4h project for her cat Jon and his brother Jasper. 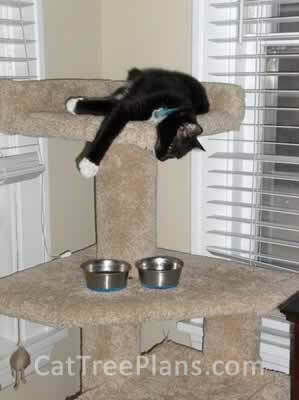 Jasper is on top and Jon is on the bottom. Both love the stand and pretty much do not come off of it. 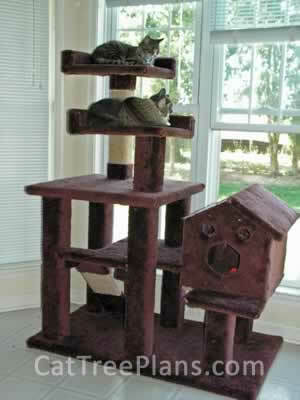 We have it placed in front of the window for easy viewing for the cats. Our birdfeeders are out there. Thank you very much for these plans. Can't wait to try more.